Kobe Bryant is having a hell of a year. He scored 40 points against the Nuggets a couple of days ago….and the Lakers lost the game by 12 points. 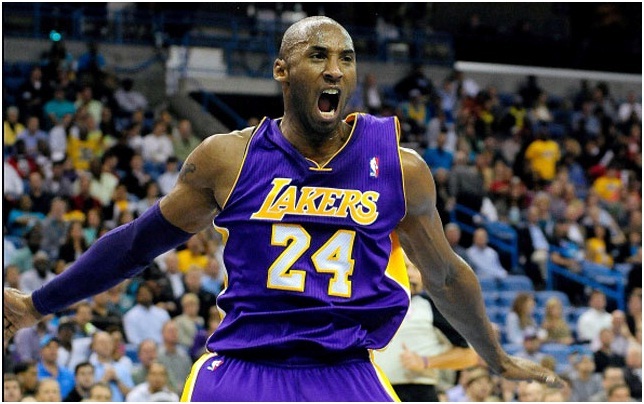 That Lakers- Nuggets game marked 116 times in his career that Kobe has scored 40 points or more. He has just finished scoring 30 or more points in the Lakers last 10 games. Kobe had just completed his new home in Newport ….and now the mansion belongs to his ex wife, Vanessa. Kobe recently broke the 3,000 point scoring mark and the Lakers have fallen below .500 once again. Like I said…..a hell of a year. One truly bright spot is in the NBA All Star voting which has just cast its second ballot with Kobe finishing first, ahead of LeBron James by over 7,000 votes. After Kobe and LeBron comes Kein Durant and Carmelo Anthony. Starters in the east also include Rajon Rondo, Dwayne Wade and from the west are added Chris Paul, Blake Griffin along with fellow Laker, Dwight Howard. Quite an honor for all of these great athletes. Other Lakers to make the All Star roster are Pau Gasol and Metta World Peace. The third and final balloting will take place on January 14 with the 2013 NBA All Star Team to be announced on January 17. After participating in the Olympics as part of Team USA basketball along with several other All Star Players, Kobe has had a very triumphal, yet frustrating year trying to see his Lakers through a transition after 2 coaching changes in less than two years. The Lakers have seen major changes in personnel as well with Derek Fisher and Andrew Bynum leaving the Lakers only to be replaced by Dwight Howard and Steve Nash. Some would say that that is a pretty good trade off. Now, on top of everything else, Kobe and his wife Vanessa are now getting divorced and Kobe will have to come up with a cool $75,000,000 just to close the deal. Kobe, however, does not seem to be too distressed about the situation. He and Vanessa have had an on again off again relationship for years now and from the looks of recent photographs of them together, they are anything but adversaries. Kobe seems to be taking it all in stride and as a little reward for his patience and perseverance, he just bought himself a brand new $330,000 Ferrari!